Sorry Ricardo, I could not accept your poker invite. I do not have the pass (although I do not care much about poker anyway, I just lose all my money in it). Frustration after ten tries or so! A4 license with the Aston? Many keyboard players have problems with it. I got that test done after few more tries with time 1:15.79. Only .13 seconds under the target time. The last test was easier, because there you didn't have to drive so precisely, just fast and pretty clean. I then did the first A5 championship with that Solar Crown Lotus and I'm gonna Buy Audi RS6 station wagon for the A4 championship. I've had enough of Aston Martin's (and other RWD's) for a while. That's such a shame about your wheel! I tried for about 5mins with the keyboard, then unpacked the wheel, lol. Yeah, you're meant to be able to play around with the accelerator and brake linearity in the driving menu there, and apparantly that's meant to help for keyboard players, so the gas and brake isn't so on/off. I've no idea which way to adjust it though. and moving it right makes it less sensitive.. I have the slider for brakes almost fully to the right, which works okay for me. Tip: If you think the game is too easy, you can adjust the difficulty level by drinking beer. Bandit, i have both fully to the right, and my sensitivity for gas in the Logitech Profiler to like 10%, and still it's too much for me. As soon as i put my foot on the gas, the car's off. Really hard when it's this sensitive. But that doesn't make any sense at all! Because yesterday i started playing around with that, thinking i was wrong and had it set wrong. Put my gas sensitivity in Logitech Profiler back up to what it was. And ingame, took the gas linearity to the middle. I'm not worried about brake, not touching that for now. If it’s too sensitive, move it to the right. If it’s not responding quickly enough, move it to the left"
My result was the direct opposite! Unless i simply have no feeling at all, and i am doing it all wrong. I don't get it. So am i doing it all wrong? Is there something in the Logitec Profiler? I don't know anymore. I'm confused. I think I saw an official message about that screw up somewhere, but I can't find it again. PS. 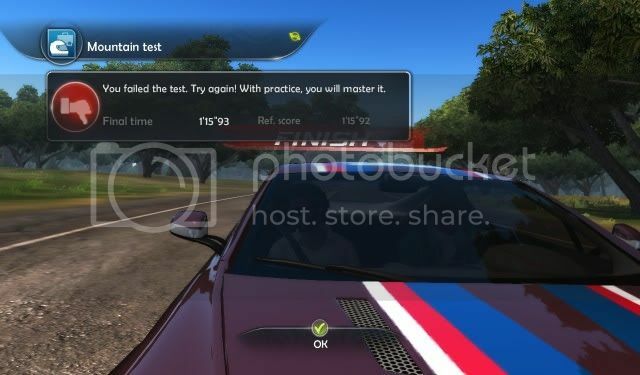 Didn't some NFS game have similar error with over/understeer, where developers did not apparently understand these terms and got them backwards? I dunno Jussi. I'm just confused. And to be honest, i'm not sure what difference there is, lol. The brake, yes, i can feel that being more sensitive when it's more to the left. But honestly, i dunno anyway, lol. Hey, Jussi, Bandit, Ricardo, when do you play? I never see any of you.